Mitch Maki named interim president/CEO, as Vince Beresford steps down. Vince Beresford is stepping down as president and CEO of the Go For Broke National Education Center, just six months into his tenure as leader of the organization. Mitch Maki, Ph.D., a member of the Go For Broke board, will take over as interim president and CEO. Beresford will continue to work for Go For Broke in a yet-be-determined capacity, but he explained in an interview with The Rafu on Wednesday that he has been asked to become executive director of a new nonprofit organization initiated by In-N-Out Burger president Lynsi Synder. The organization will based in Baldwin Park and focus on issues of substance abuse and human trafficking. Beresford in a July 11 letter to Go For Broke supporters, explained that his life has been deeply affected by drug addiction and that his mother is currently homeless by choice due to addiction. “I am not saying goodbye, I am merely changing the role in which I serve our organization,” Beresford said. Maki is a professor at Cal State Dominguez Hills and wrote “Achieving the Impossible Dream: How Japanese Americans Obtained Redress” with his mentor the late UCLA sociologist Harry Kitano. He also serves on the board of governors and scholarly advisory council of the Japanese American National Museum. Maki is taking a leave of absence from CSUDH until the end of the year. He will lead Go For Broke as it searches for a new president and CEO and looks ahead to Evening of Aloha, the annual gala dinner to be held on Oct. 1. “My job is to help find that next person who will be the permanent CEO. And the way we framed where we are at is that this is an opportunity to continue the growth of the organization and to welcome unexpected change in the process,” Maki said. 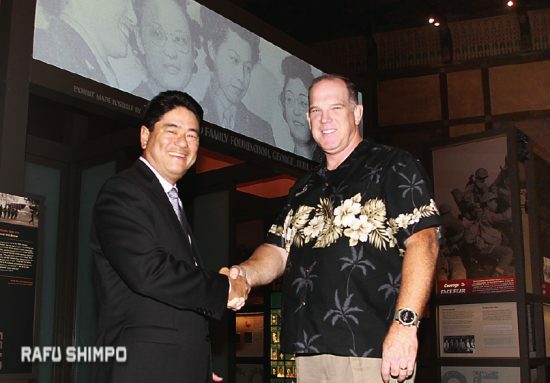 Maki expressed appreciation for Beresford who he credited with expanding the vision of Go For Broke, which opened its Little Tokyo headquarters and exhibition “Defining Courage” on Memorial Day weekend. “He brought specifically the hope and vision that the story of the veterans is more than just a Japanese American story that will stay in the Japanese American community,” Maki said. He noted the many organizations, including JANM, Keiro and National JACL that are currently in search of new leadership. Beresford added that this moment should be seen as an opportunity for the Japanese American community. “This is an opportunity not just for these organizations but for the JA community to be at a launching point. At the shift where there’s so much there that you can uniquely offer that other communities can’t. They don’t’ have this history, these American stories that are going to benefit everyone of every ancestry,” he said. Beresford said he has been changed by his brief time with Go For Broke. He told the story of a Nisei veteran who asked to talk with him after the exhibition opening. As his family watched, the veteran gestured to Beresford to move closer so he could speak with him. “We’re almost touching heads, and he looks up at me with tears in his eyes and he said, ‘Vince, this was probably one of the best days of my life.’ All the memories and difficulties of putting that event on, everything was gone at that point,” Beresford said. Maki’s father is a Korean War veteran and an uncle served in the 442nd Regimental Combat Team E Company. He said the story of the Nisei veterans continues to resonate in recent events.